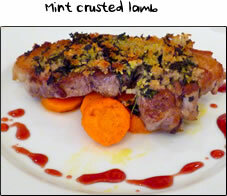 This is one of my favourite kind of dishes because you can create the photo below in only 17 minutes! 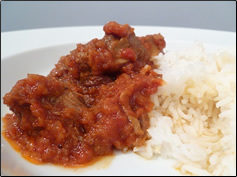 It tastes fantastic and uses only 5 ingredients, a great example that you don't need 20 components to make a delicious dish. 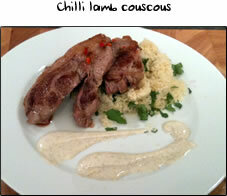 Succulent lamb, light fragrant couscous with a sticky sweet chilli sauce - simple but impressive! Before you start, chop your chilli and coriander. Boil your kettle, put your frying pan on a high heat and click here! 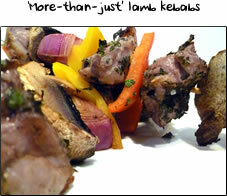 Boil your kettle and put both of your pans on the hob, the one for the lamb on a high heat. Season the lamb on both sides with a good pinch of salt and pepper. Take your board over to the hob and when you see the pan just starting to smoke, add a little swirl of oil to your frying pan and then add the lamb and cook for 2 minutes on each side. Whilst the lamb is cooking, get rid of your board and go and wash your hands. Next you need to add your couscous to the larger pan and get your recently boiled water. Add enough water to just cover the couscous. Turn the heat on and add a pinch of salt, pepper and a tablespoon of oil. Give it a little stir, turn the heat off and pop a lid on for 5 minutes. Next it's straight on with the sauce. Turn the heat on the small saucepan and add your tomatoes and chilli. Add a little water just to loosen, about 3 or 4 tablespoons. 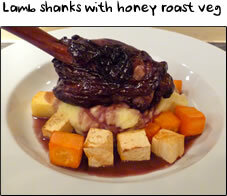 It should now be about time to turn your lamb, which should look nice and caramelised. Turn the heat up on your tomatoes and add a pinch of salt, pepper and a teaspoon of sugar. Give it a stir and let this bubble away. The tomatoes should be starting to break down (not emotionally) and you can give them a bit of a squeeze with your spoon to break them down more and get the juice out. Your lamb should be done now, so turn the heat off and remove to a board on your work surface. Hopefully your tomatoes are boiling away nicely, so give them a press again with your spoon in the pan and then turn the heat off. It should now be time to take the lid off the couscous, which should have absorbed all the water, so give it a little fluff up with a fork and then add your coriander. Give it a good stir together and take everything over to your work surface. To serve, if you're using a cooking ring, run it under a hot tap to warm slightly, then place the ring in the centre of the plate. Fill the cooking ring with the couscous and press down with the back of the spoon. If you don't have a cooking ring, then put a pile of couscous in the middle of the plate and shape it with your hands to a nice compact pile. Remove the cooking ring and then spoon the sauce, avoiding the tomato skins, around the side of the couscous, using whatever artistic flair you have. 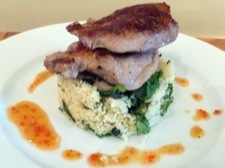 Finally, cut your lamb in half and then carefully place the lamb in 2 stacks on top of the couscous. And you're done!